Pershing Square CEO Bill Ackman has cashed out his stake in Nike after making about $US100 million, according to Dow Jones. Ackman recently exited a years-long bet in Herbalife that reportedly cost him hundreds of millions of dollars. The apparel maker is set to report earnings after the market close on Thursday. Bill Ackman has dumped his stake in Nike after making about $US100 million, Dow Jones reported on Thursday. Pershing Square, the hedge fund Ackman runs, disclosed a passive stake in a January regulatory filing. The stake totaled 5.836 million shares according to Bloomberg data, and was acquired during the fourth quarter. Nike shares have climbed nearly 4% this year. The apparel maker is set to report earnings after the market close on Thursday. 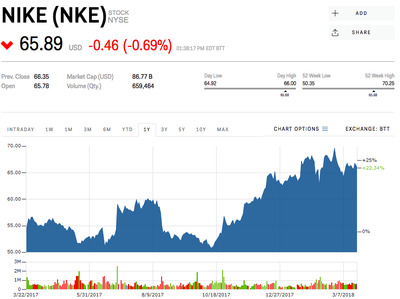 Unlike some other investments Ackman has made, the Nike stake was passive, meaning he didn’t snag a large-enough position to clamor for executive or strategic changes at the firm. It was an apparent win for the activist investor, who recently exited his $US1 billion short position in Herbalife that likely cost his firm hundreds of millions of dollars, according to the Journal. Check out the Wall Street Journal’s story here.